Making do with what’s available is an essential part of living a comfortable life. No matter how large the home, there will always be one room that could stand to be just a little bit bigger. Unfortunately, we can’t always expand the rooms we want, but we can use paint to create some illusions. In the hands of an experienced craftsman, paint can be a powerful tool. Using certain techniques, a professional can make a small room appear larger than it is, adding comfort and extra utility to the space. This technique is a classic way of bringing a sense of space to a cramped room. You’ve probably seen it before, and there’s a good reason for that; it works. Using a pale or neutral color allows for better light reflection, making the area appear larger. An easy way to see this in action is to view a room both with the curtains open and with the curtains shut. The difference should be noticeable. Light colors can also make walls appear as if they’re moving away from the room’s center. 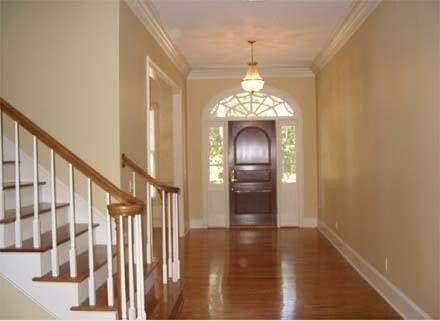 Painting trim white and the walls another light color can enhance the wall’s withdrawing effect. Remember, white and beige don’t have to be your only options; light colors can include pale blues, greens, yellows, and even lavender. These colors combined with a light colored trim will enhance the room’s sense of depth. Any room, even a large one, with a low ceiling can take on a confined feeling. Luckily, a few simple tips can trick the eye into thinking a room has much higher ceilings than it actually does. Painting vertical stripes of alternating colors can draw the eye upward, adding the feeling of increased height. Going against the light color trend, painting the ceiling a darker color than the walls can also help draw the eyes up. Be careful not to go too dark with the ceiling or walls, however. A room scant of light colors might seem cozy, but with the coziness comes a sense of restraint. There are two main types of room extension. The first makes a room an extension of itself. By painting walls and ceilings the same color, or even very similar colors, the eye is able to travel around a room unhindered, minimizing the feeling that you’re in an enclosed space. The second creates the illusion that the room extends into another space. Small rooms that are painted the same color or a similar shade of color as a conjoining room, can benefit from the visual effect that the rooms meld together. This can make smaller rooms appear as if they continue on into other spaces. Painting walls to match the outside world can have a similar effect. Greens and yellows can make rooms appear as if they’re an extension of the landscaping. This technique is especially useful in rooms that have many windows, or entryway rooms preceding the main home. The practicality of this method will depend on what color the walls have been painted. Assuming the walls are a color you wouldn’t mind having on your furniture; using similar shades on both can help the furniture blend in, offering the appearance of a more spacious room. A fresh coat of paint will certainly be more affordable and easier than physically expanding a room. Our experts are well versed in livening up small spaces, and we know how to make a cramped office feel like an expansive conference room. If you have a room that needs painting, consider giving us a call to chat with one of our professional color consultants. We’d love to hear from you.